Lawmakers in the nation's capital approved a $15-an-hour minimum wage Tuesday, joining numerous other cities and the states of California and New York in mandating pay raises for retail, restaurant and service-industry workers. The D.C. Council unanimously approved the wage increase, which will directly affect more than 125,000 low-income workers, and Mayor Muriel Bowser has pledged to sign it when it reaches her desk, likely sometime this summer. D.C. currently has a $10.50 minimum wage that will rise to $11.50 in July under legislation signed in 2014 by Bowser's predecessor, Vincent Gray. Labor advocates began pressing the city to raise wages even higher, however, after the movement for a $15 minimum found success elsewhere, including in Los Angeles, San Francisco and Seattle. Supporters of the higher wage had been collecting signatures for a ballot initiative, but they have agreed to abandon that effort. Bowser said it has become clear during her 17 months as mayor that wages need to be higher to lift more city residents out of poverty. "I see how much it costs to live in Washington, D.C., and that cost is only going up," Bowser said. "Even at $15, it's tough to be able to afford to live in Washington, D.C."
The bill would raise the wage gradually until it hits $15 in 2020. After that, future increases would be tied to inflation. Elisandro Morales, 30, who works two part-time jobs as a janitor -- one pays $14.10 an hour, and the other $10.50 -- said a $15 minimum wage would allow him to work just one job with predictable hours and spend more time with his children, ages 5 and 2. "I've got to get two jobs right now in order for me to keep up with my bills, and that's not enough," he said. Some business advocates have argued that raising the wage to more than double the federal minimum of $7.25 -- which is also the minimum wage in Virginia -- will prompt employers to lay off workers or even move to neighboring jurisdictions. "D.C. can either have the same number of opportunities it has in the service industry right now, or it can have a $15 minimum wage, but it can't have both," said Michael Saltsman, research director for the Employment Policies Institute, a right-leaning think tank. 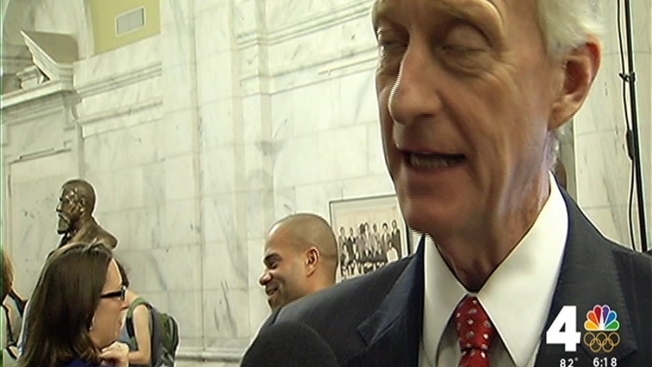 "It could be problematic for the city in getting new businesses to come in and even retaining some of the old businesses," D.C Council Finance Chairman Jack Evans said. "So the jury’s still out." "Virginia and Maryland are expanding and growing as well," said Kathy Hollinger of the Restaurant Association of Metropolitan Washington. "We do have to be mindful of competitive disadvantage." Mayor Bowser has a task force looking at all the pressures on city businesses. "It’s always been more expensive in the District than it will be in the far-flung suburbs," she said. "People want to be in the district. We’re always concerned about balancing our competitiveness in the region." Three years ago, the debate over wages in the District centered on a bill that would have required Wal-Mart and other big-box retailers to pay their employees $12.50 an hour. Gray vetoed that bill after Wal-Mart threatened not to build additional stores in the city. Ultimately, Wal-Mart decided earlier this year not to build those two stores, which had been planned for neighborhoods with high rates of poverty and unemployment. This year's debate over wages focused largely on how to guarantee minimum-wage compensation for workers who rely on tips. The current minimum wage for servers and bartenders is $2.77 an hour. Bowser proposed raising it to $7.50, but after lobbying by restaurant owners and employees who said they benefit from the tipping system, Council members agreed to a $5 tipped minimum.